There is always something interesting wherever you go in New York. This weekend, waiting for the #1 downtown train at the 59th St station, the subway travelers were treated to a really incredible singer. She was on the opposite side platform, so the snippet Video of the Unknown 59th St Singer is a bit dark and noisy, but the singer's voice comes through quite nicely. A snapshot grabbed from the video. The video is of Mad World, Google search says it is by Gary Jules (Mad World), also on Donnie Darko Soundtrack. And covered by many other singers as well. But this unknown singer on the subway, she was the best, and she had the best stage too! Simon And Garfunkel's Scarborough Fair. Really, really, great to hear such nice singing, in the busy underground world of NYC subways. To whoever that singer was, thank for your singing this weekend [2011-Nov-12]. 205 E Houston Street (corner of Ludlow St), New York, New York. Given that the smoked meat available at Schwartz's in Montreal is my number one food choice, there needs to be some mention of corned beef and pastrami in New York too - the other big city in the world for cured meat. Katz's Delicatessen is pretty good. It certainly exhibits quite a few quirks and oddities that provide a quintessential New York experience - but the food is good too, better than some of the other similarly famous pastrami and corned beef places in New York City. It has been in business since 1888 - a long time - which is usually a very good indication of a good restaurant. When you enter the place, you are handed a ticket - hold on to it, and get it filled in when you order food - loose this, and they they will charge you $50! Diners also have to enter and exit in a single file. The meat is quite good - nice, spicy enough - certainly still not comparable to Schwartz's - Schwartz's is more spicy, more tender, but Katz's is a pretty good alternative. And like all things American (US-American), the quantity is outrageous - too much meat. So, too much for one person, but great to share between 2-3 persons. 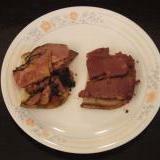 And smoked meat fans won't need to be told this, but these sandwiches are best with rye bread, with mustard, and nothing else. Black Cherry soda for a drink, or hot black tea (well, hot black tea is probably just me). The sandwiches go for around $15, not including tax and tip. 2651 Broadway, between 100th and 101st streets, The Upper West Side. Also at 484 Amsterdam Ave, between 83rd and 84th streets. Their rotisserie chicken is superb. From the menu, Pollo a la brasa - Peruvian Special Chicken, Whole - "looks like a regular roast chicken, but the difference is our special ingredients". And this is true, fantastic chicken, nicely spiced (lemon? garlic? cilantro?). Have not eaten anything else from their extensive menu, always go for the takeout - "two whole chickens cut-up". 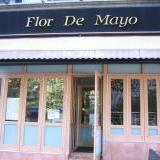 The menu has Peruvian dishes, Hong Kong Special items, Spanish items, as well as the standard Americanized-Chinese dishes. This restaurant find is courtesy of the New York Times article "In Quest of the Perfect Roast Chicken", dated February 23, 2005, by Julia Moskin. 37 Spring St, between Mott and Mulberry St, New York City. Heavenly Rice Pudding, in a Funky, High-Tech, Modern Decor. Not only is the pudding great, with many cool flavors, the packaging is also unique - deep saucer like containers add to the out-of-this-world look of this place. Choose from a varied list of flavors, around 15 each day. The servings are Solo, Sumo, and Moby. Even the Solo ($5) is big enough to substitute as lunch for one - it is more than just dessert. Add toppings like mischief- buttery graham cracker crumble - and this will leave you full. In my opinion, the best hot dogs have a snap to them, are grilled, and are not skinless. 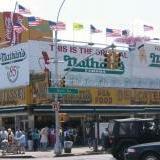 Nathan's in Coney Island claims to be very good, and it is. 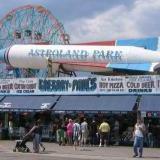 Take the subway to Stillwell Ave/Coney Island, and it is across the street. But I would not recommend it - everyone seems to want to eat here, and even with multiple lines, and only ten people per line, it takes over 30 minutes to get to the front and get a hot dog. Not worth it - especially since most of the hot-dogs sold by all vendors are actually made in one or two places only - Sabrett is the main one in New York. Gregory and Paul's, also at Coney Island, is a better choice - great taste, and no waiting. There are two of them - one on the boardwalk, and the other one across from the Cyclone roller-coaster ride. French Fries are a different matter - it is important to eat fries that are no more than a minute or two off the fryers. So, look for a place that is crowded - that way you know the fries will not be stale - even five minutes is no good for fries. So, Nathan's always has the best fries, at the other places, it depends. 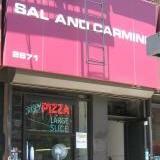 Sal and Carmine, Pizza at 2671 Broadway, between 101st St and 102nd St.
New York pizza at its best - thin crust variety. Get the spinach pizza here. Could do with a bit less salt, but all in all, some of the best pizza you'll find anywhere. I should say I like both thin and thick crust pizza - the original Uno's in Chicago has some of the best thick crust pizza, but there are many others in Chicago with great thick crust pizza. So, thin or thick, as long as it is pizza, keep it coming! Except for that abomination called Hawaiian Pizza - keep that away from me! I never understood why sweet toppings like pineapple should go on a pizza, and even chicken is borderline, rarely acceptable - what amazes me is the existence of a whole chain dedicated to such food, California Pizza Kitchen, atleast the name is good warning for guys like me to stay away! Only acceptable pizza toppings are the standard ones: cheese, pepperoni, sausage, mushrooms, green peppers, anchovies, onion, and so on. None of the Californian or Hawaiian stuff! Rumors! There have been continuing rumors that the owners are going to close the place down. Sep 2006, rumors were strong that it finally was closing - but in 2007 the place was still open. Broadway, corner of 104th St.
Get the combo sandwitch, the plate if you are hungry. Falafel with either chicken or gyro. This is my regular place in NYC, I always make it a point to eat here when I arrive, and before I leave, at least! 2006 - Owners Changed Under new ownership now, I understand. Not sure it is as friendly as it was before, food also seems to have changed, so not a place I go to anymore. There it is, New York City, and what more needs to be said about it? Is there any other city as amazing as Manhattan, NY? To me, Manhattan is at the top of the heap as a people-watching place. Everyone is so hurried here, everyone does everything for a purpose, everyone is so motivated and believes strongly in everything they do, everyone is so efficient with their time (no watching sunsets here), and of course, people are truly quite unfriendly here (you haven't lived until you get a tongue-lashing from a NYCer -- "do I look like I am here to give you directions" -- when all you did is ask if Broadway is to the East or to the West of you!). I love the city; I wouldn't live there - too fast paced to handle, but it is great to visit. And frankly, it does not deserve its bad reputation -- it is not really that dangerous anymore (it used to be scary a long time ago. I remember having to remove the radio from my car before parking in Manhattan, but that is now decades old history), and the people are really not that unfriendly -- you just have to persist a bit longer, and you'll find people who are very helpful. As to the food, it does not disappoint -- you can find any kind of food you want, and it will be superb in almost any restaurant -- NYCers see to it that only the good restaurants survive to stay open! In addition to the sections below, more on food along with pictures is in the New York gallery section. Includes pointers to great Sichuan food.